The Democratic senator is introducing legislation to break them up, but he’s in an uphill battle—against not only the GOP but his own party. In olden days, it used to be that the bad guys robbed the banks. Now it seems the bad guys are running the banks, at least the big ones, and robbing the rest of us. Nearly every day, newspapers have another disturbing report about how the largest and most influential banks managed to escape prosecution for their blatant fraud or else finagled outrageous subsidies and profits from their monopolistic dominance of the financial system. The worst that happens to privileged bankers who are “too big to fail” is an occasional scolding lecture from angry members of Congress. Democratic Senator Sherrod Brown, fresh from his impressive re-election victory last fall, is back again with a simple, straightforward solution: make the big boys smaller. He is working on legislation with Republican Senator David Vitter to break up the half-dozen mega-banks and strengthen capital standards. This forced downsizing would make space in the marketplace, allowing many more midsize and smaller banking institutions to flourish. It could also protect the nation from another disastrous bailout of Wall Street at public expense. “It’s not just that they are too big to fail,” the senator says. “They really are too big to understand and too big to manage. They are certainly too big to regulate. And they have only gotten bigger since the financial crisis.” The concentration of banking power in a few big-name firms was already dangerous. Now it is even more dangerous. In earlier eras, such a gross distortion of the economy would have prompted popular outrage, political campaigns for reform, then government legislation. In our time, the outrage is plentiful, but the political system is dead in the water. Despite the vast destruction produced by the concentrated banking system, neither party wants to embrace the remedy Brown proposes. The Dodd-Frank reform law of 2010, incomplete though it was, has been utterly stymied by the billion-dollar lobbying campaign of the financial sector. Nearly three years later, fewer than half of the regulations needed to implement Dodd-Frank have been completed. The president’s proud boast that the law put an end to “too big to fail” banks has been twisted into Wall Street’s sick little inside joke. Brown is guardedly optimistic that this can be changed. In 2010, when he proposed the same concept as an amendment to Dodd-Frank, he got only thirty-three votes. Yet afterward he told me he was confident the proposal would prevail someday, because business and even regional banks would eventually see that extreme Wall Street concentration is not good for the economy, the country or themselves. Brown is not one of those hot-dog legislators you see on TV, grabbing attention with ridiculous claims. Nevertheless, he believes that breaking up the behemoths is a cause that can gain momentum as a bipartisan issue. It’s not as crazy as it sounds; the public anger aimed at the mega-banks is not really a right-left matter. Indeed, anti-trust legislation originated in efforts to protect the free market from overbearing monopolists who crushed small and midsize businesses. But it’s an uphill fight: in 2010, Brown’s amendment received only three Republican votes (Senators Shelby, Coburn and Ensign). Now Brown is talking to ten Republicans who have expressed interest in his reform, and he hopes to connect with more. Maybe Brown is being too polite. As he knows, the question of the big banks is deeply divisive for Democrats. It is an internal conflict that has roiled the party for two decades, ever since the center-right dogma took over in the Clinton era. Bill Clinton brought in the Robert Rubin team in 1993 to chart economic policy, and finance-friendly policy types have governed ever since. Democratic activists still faithful to older liberal-labor principles are usually excluded. Obama was already in with Rubin and his crowd before he came to power. He has stayed true to that perspective as president, relentlessly excluding contrarian thinkers and treating big bankers with a gentle touch. No “Go Directly to Jail” cards in his deck. Some of us hoped Obama might allow a little more variety in his second term. That’s not going to happen. Old faces, mostly associated with the Clinton years, are still running the show. Many learned well at Rubin’s prep school for policy wonks. Lew was baptized by his tenure at Citigroup, where in 2008 he was paid an extraordinary $1.1 million or more for his short-term labor before returning to Washington to re-enter government. Gene Sperling, director of Obama’s National Economic Council, got a similar baptism at Goldman Sachs. Boiled down to its essence, Senator Brown’s legislative initiative may compel Democrats to ask themselves, Are we with the people on this, or should we stick with the big guys? This may prove to be a seminal question for the future of the party, not to mention the health of the economy. If Democrats stay with the financial titans and ignore the disorders of the Wall Street monopoly, the party will become ever more distant from its working class legacy. 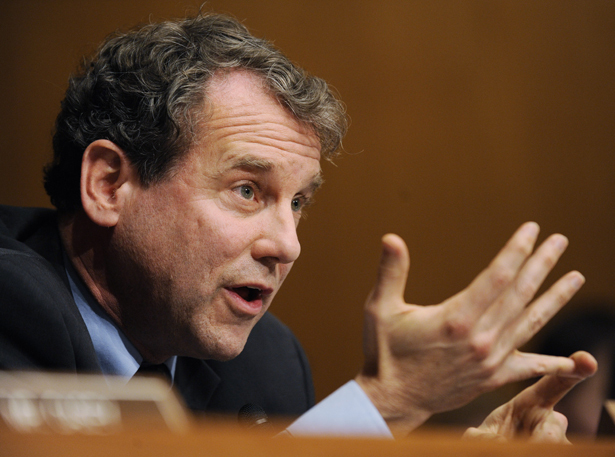 If instead Democrats like Sherrod Brown, joined by newly elected bank critics like Elizabeth Warren, lead the party in the direction of aggressive reform, we might see the beginning of something big. Editor's Note: An earlier version of this piece reported that Vitter was co-sponsoring legislation to break up mega-banks. In fact, Vitter is co-sponsoring a bill that would strengthen capital standards.